Complements from Club Captain; Club Captain Tommy Foley paid tribute to all volunteers who acknowledged the call for help and turned up in great numbers on Tuesday 16th. Tremendous work was done on bunkers and grass cutting. This exercise was so supported that every Tuesday will be a volunteer day from 11am to 1pm. Very much appreciated. J.B. Carr winning team to battle again; The JB Carr Team will compete against Clonmel in Templemore on Thursday 24th. at 4pm. This is the County Final competition and The club Captain Tommy Foley expressed that all members available to turn up to show their support for this winning team. A.I.G. Pierce Purcell 26/27th. May; in Ballykisteen Golf Club. Round 1; Ballykisteen-v-Templemore. Round 2; Ballykisteen/Templemore-v-Winners, Clonmel/Thurles. The best of luck to all. Congratulations; Congratulations to Club Captain Tommy Foley on his first win on the 18h singles. Great to see Tommy’s golf improve with his massive unique drive and course accuracy. A contender to watch as the season develops. 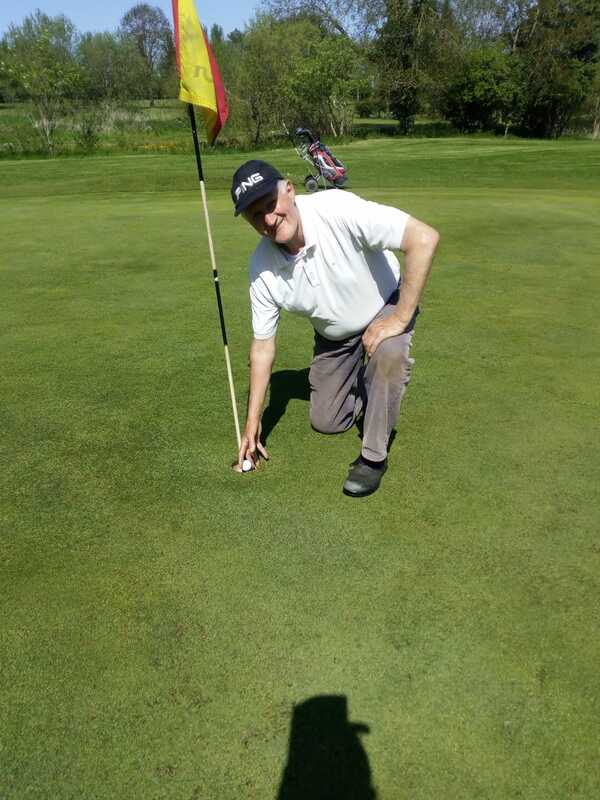 Also, congratulation to the Club PRO Tony O’Toole on achieving his first “Hole in One” on Wed. 16th. at the par 3 on the 5th. green, In the presence of Captain Tommy Foley and Photographer Rody Cawley. An achievement desired by all golfers. Wed. Social Mixed; The renowned Social Mixed operated by the Ladies will commence on Wed. 23rd. May. This event has always been very well supported over the years and it will be a great delight that it’s commencing again for 2018. 50 Year History Book; The club will be celebrating 50 year in existence in 2021. The club has nominated PJ Leahy as the club historian to perfect this project and piece together all memorabilia that can be resurrected to make this project successful. PJ requested that all members past and present to dig deep and search their achieves for any memorabilia that they can find. All will be appreciated and returned as received after the process. Away Score Recording Sheet; The “Away” Score recording sheet for “Qualifying”, “Non-Qualifying” , “Society”, “Fourball” and “Team Events” is now placed on the Locker Room Notice Board. The club handicap Secretary John Greed has expressed that all members playing away or in other societies to record their score on this sheet. This is a very important request as it is part of the “Golf Ethical” for calculating accuracy on handicap ratings. Volunteer Work Day; The volunteer work day is organised by Vis- Captain John Stapleton on every Tuesday from 11am to 1 o’clock. John Stapleton would like to see as many members as possible to assemble at the work shed to give just 2 hours to this important work on the course needs and attention. Club Lotto; A new finance sub-committee has been formed to run the Lotto which will be a 50/50 Lotto. More details will follow in the weeks ahead on this great fund railing development project for the club. Club Captain Tommy Foley expressed to all members to give this project your full support. One Rate for Green Fee; The Green Fee for 2018 is now €10 for 9hole or 18 hole. The advantages of Playing Golf in Templemore 9 hole Golf Course ; A magnificent Golf Course to test your golf skills. Templemore Golf Course is available to all golfers, members and non-members and members from other clubs to get in your practice rounds, beginners, Active Retiree’s and families who want to take up the sport will get assistance from any committee member, (refer to web site for committee member list) here are some positive reasons for golfing in Templemore Golf Course; Golf can be good for your health and your heart. Walking an average course for a round of 18 holes of golf can be between five to seven kilometres. If you walk 18 holes three to five times a week, you’ll get an optimal amount of endurance exercise for your heart. If you pull your clubs or carry them, you’ll burn even more calories each round and benefit even more. Playing golf regularly can help you: Stay fit, Improve muscle tone and Endurance, Lose weight and body fat. Golf can also be a great way to keep in touch with friends, help in reducing stress as a result of the physical activity and also due to the pleasure of walking in an open and natural environment, provide opportunities to meet new people, help develop a sense of community connectedness. Golf can be a very social and enjoyable sport. While you compete against others, you can also compete with yourself to better your previous best score. Templemore Golf Course provides Good Social occasions, Presentation Nights, Social Mixed, Senior Events and Away Trips. The Handicap System allows members of different abilities an equal chance of winning. Various Category of Memberships are available at different rates. (Membership option rates are on our web site). Full Annual Membership €350 = Approximately, only 95c. per day. New members are the lifeline of the club, so all existing members are encouraged to tell all your friends to take up membership and test their skills on this challenging Golf course. Registrations Forms for new members are now available on-line on our web site, or at the club house or contact Martin Bohan 087 0509278 or any of the committee members. All are welcome. New Members Lady and Gents; All current members are encouraged to introduce at least “ONE NEW MEMBER” Lady or Gent, Junior or Student, Senior or Family, Active Retiree’s or any person interested in taking up the sport. It will be a huge advantage to building the club membership. The Seniors; There was a great turn out on Thursday 17th. May. Due to the improved condition of the course after the torment of the winter there was very high scoring and the competition was very close. Seanie Gleeson congratulated Tony O’Toole on his achievement of a “Hole in One” last wed. The winners teams were; 1st. Team; Martin Bohan, Pat Costello, Pat Maher, Bertie Keane. 2nd Team; Dinny Touhy, Paudie Grace, Tommy Foley, Seanie Gleeson. 3rd. Team; Ambrose Purcell, Mick Connell, Pat O’Connell, John Hassett. There was great banter and beverages donated from various personnel, all appreciated. Next Senior Fixture; Friday 25th. May, Tee-off 10.30am. Due to the JB Carr Team competing against Clonmel in Templemore on Thursday 24th. at 4pm. All are requested to support the JB Carr team. Next Seniors Away Outing; Next seniors away outing will be in Rathdowney on June 12th. John Stapleton requested that all those interested to have their payment made to John at the Seniors before the date..